In Peru's remote Andean mountains, villages like Chanta Alta only have electricity for two hours a day. Despite this, a new pilot project is using podcasting to get important agricultural information to farmers. The farmers do not yet have the means to listen on portable MP3 players. But UK charity Practical Action has married old and new technology to podcast twice-monthly updates to eight information centres in the Cajamarca region. These telecentres, many of which are run on solar power, automatically download the programmes onto CDs to rebroadcast them on local radio stations. The charity has found it effective to distribute audio material to local people, who prefer listening in their own dialect to being sent the written word. 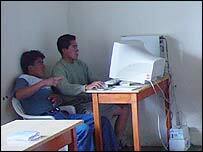 Each area within Cajamarca is sent information relevant to them. In Chanta Alta, the podcasts concentrate on cattle-raising husbandry and on dairy production. In nearby Chilete, podcasts are being used to give tips to farmers who have no experience of growing grapes. Practical Action's team leader in Peru, Cecilia Fernandez Morales, told the BBC's Go Digital programme that managers are now training local people to make their own podcasts. "They have been very popular with local people and now we are receiving more questions from local farmers which we are trying to answer. "We are also hoping that the database of podcasts on the internet will be used not just by Peruvian farmers but other farmers in Latin America." The Peru project is currently running on a trial basis, and will be evaluated at the end of March. If the Peruvian podcasts are successful, Practical Action has plans to roll out similar schemes in Sri Lanka and Zimbabwe. "Our plans are to test out some of the technologies that would enable people to listen to the podcasts on a mobile phone or a PDA, in fact on any device that can play an MP3 file," said Dr David Grimshaw, international team leader on the project.